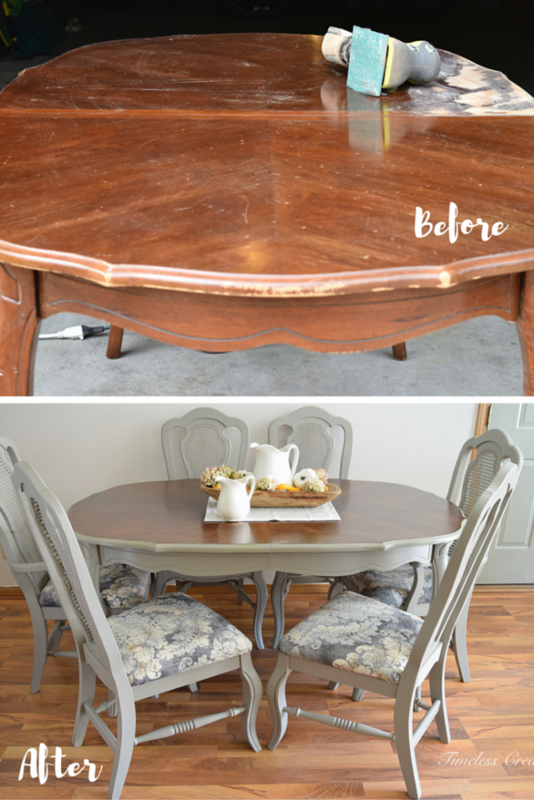 An old, worn Dining Table gets a French-style makeover. 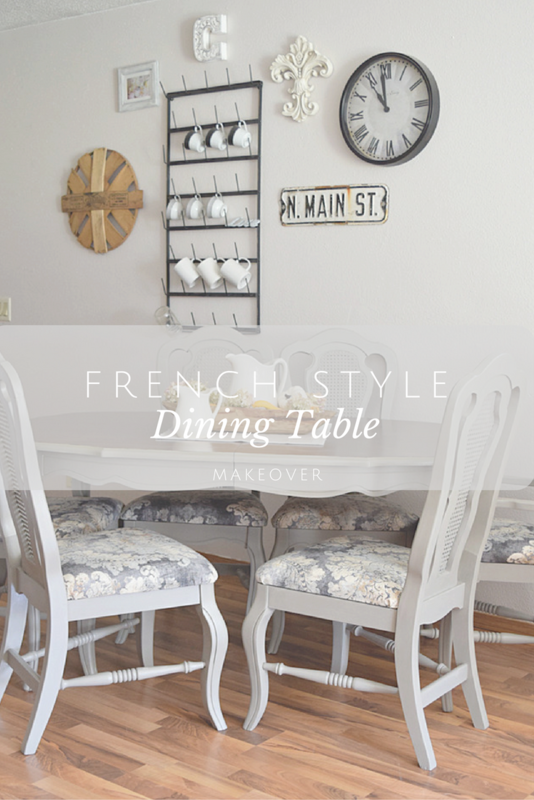 This weeks makeover makes me wish we had a formal dining room where I could keep this beautiful french-style dining set. But we can’t keep everything that comes home to the workshop…Oh well! This particular dining set was quite the project. Whew, it took us a long time to get this piece done. Really we should have had a paint sprayer for the chairs, since that would have been a lot easier. But we didn’t, and thats O.K. for now. So, I love painting, I wouldn’t be in this business if I didn’t! But for this set I had to break it down and paint two chairs a day because they were time consuming with my brush and I would get sick of it. So I would paint two chairs, then paint a different piece. And come back to two more chairs the next day! 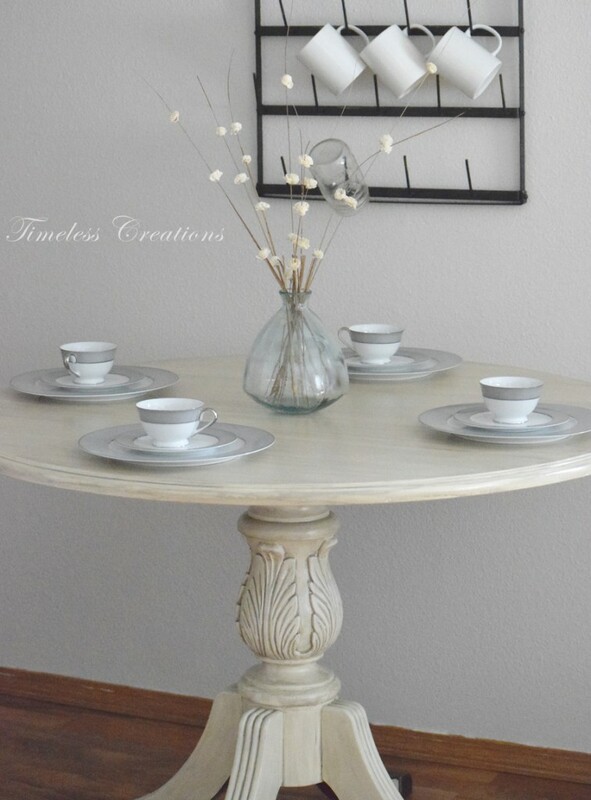 I did all of these first, painted with Annie Sloan’s “French Linen”. Two coats were needed and I went right over the caning on the back as well. 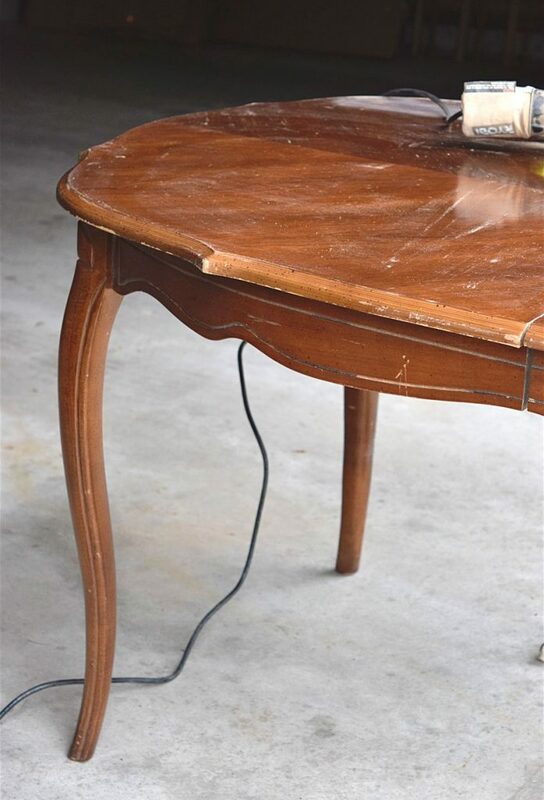 When I was able to get the table to my house to work on, I began by stripping the top using my favorite electric sander. Once that was done, I applied pre-stain and stain to the wood using a disposable foam brush. 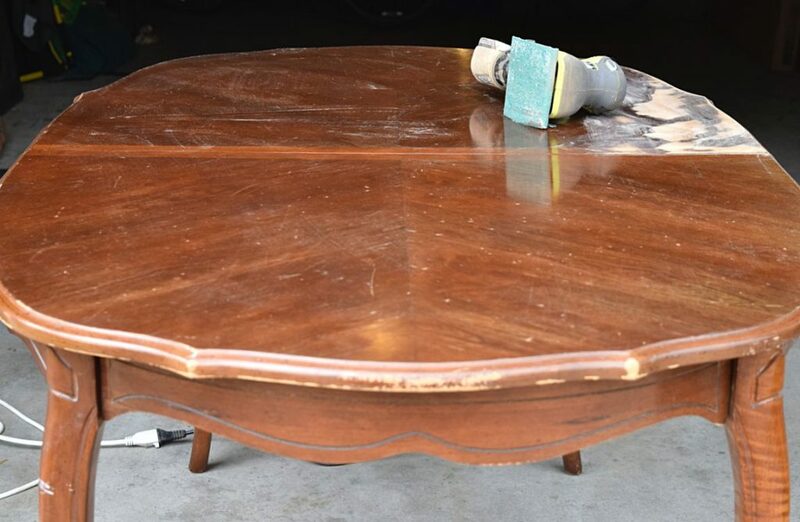 The sides and edges of the table were so marred I decided they were getting paint. 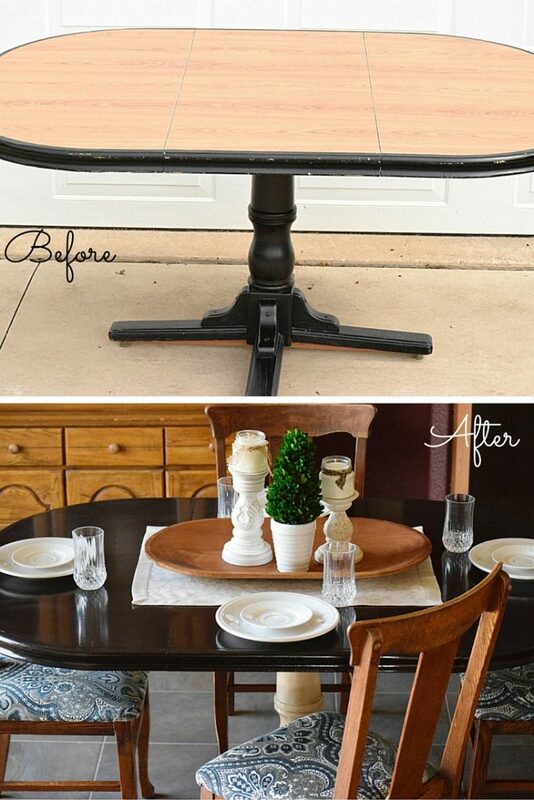 The aprons of the table, legs, and edges were given the same paint treatment, and then the entire piece (including the chairs!) were sealed with a durable topcoat. Next we had to decide what to do with the chair seats. 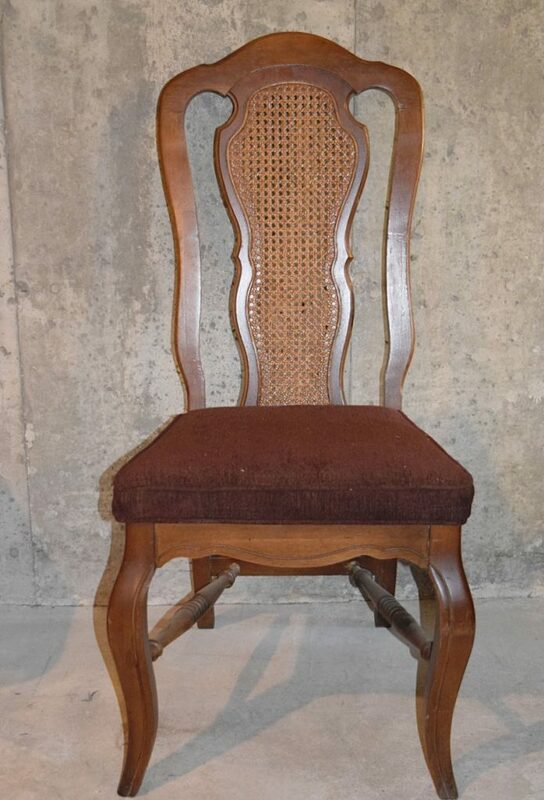 We have reupholstered dining chairs like these multiple times. They are so easy because the bottom just unscrews and you just wrap the fabric around. Find a full tutorial here. While we were shopping at Joann Fabric’s for some other supplies we needed for a client we just happened across this beautiful damask fabric. 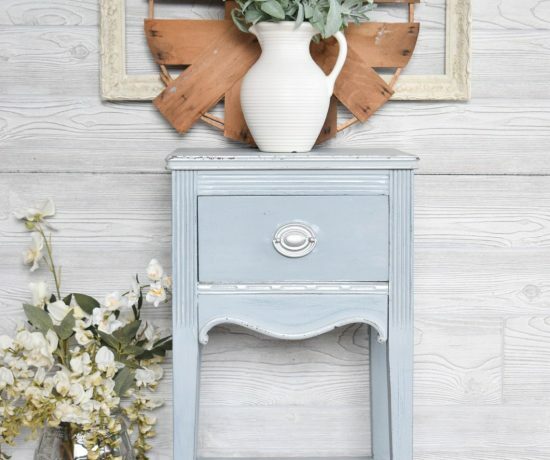 We thought of these chairs right away and snatched the rest of the roll since it was on sale and almost gone! 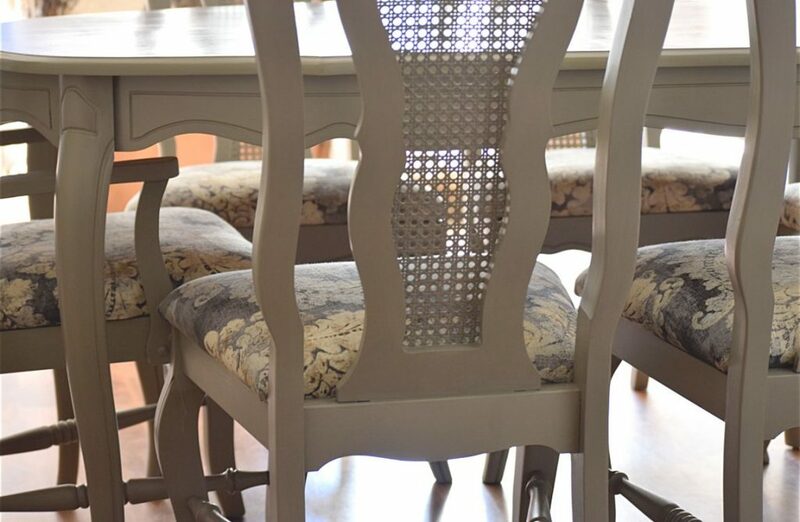 Vicki did a wonderful job with the upholstery on these, and truly it is easier than you may think to update fabric on chairs. 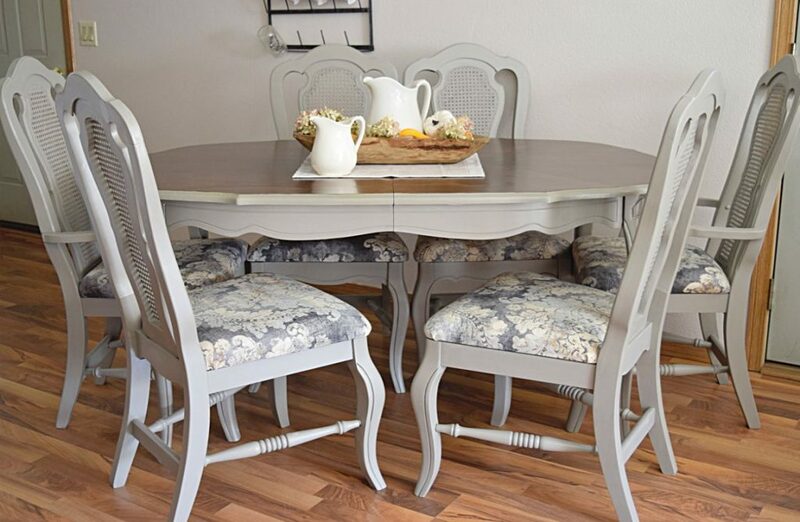 Now this dining table and 6 chairs look like a completely new set. 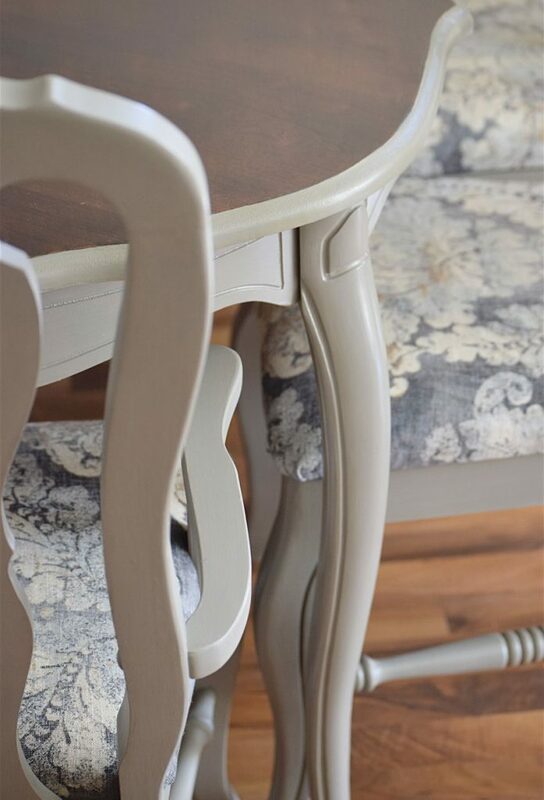 With the curved legs and the new damask fabric it has a french-inspired feel. 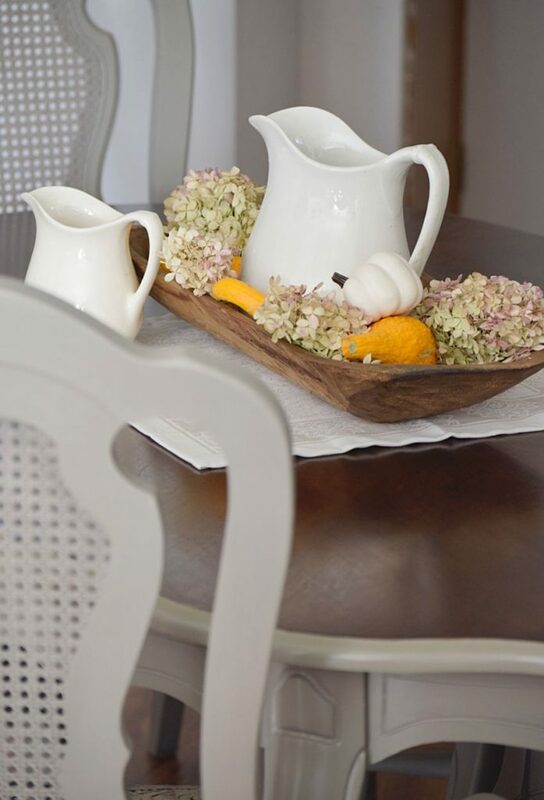 But it also goes well with my farmhouse decor I have in my house! It’s very versatile. The redo is so pretty. Great job! I love the new look. And what a find on the material. 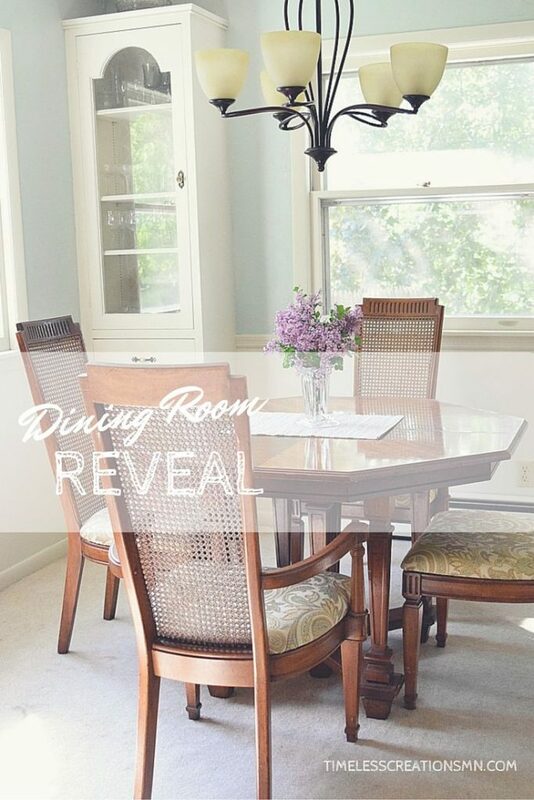 The dining room set looks wonderful. Thank you so much Lucy! We will make sure to stop by your party monthly! 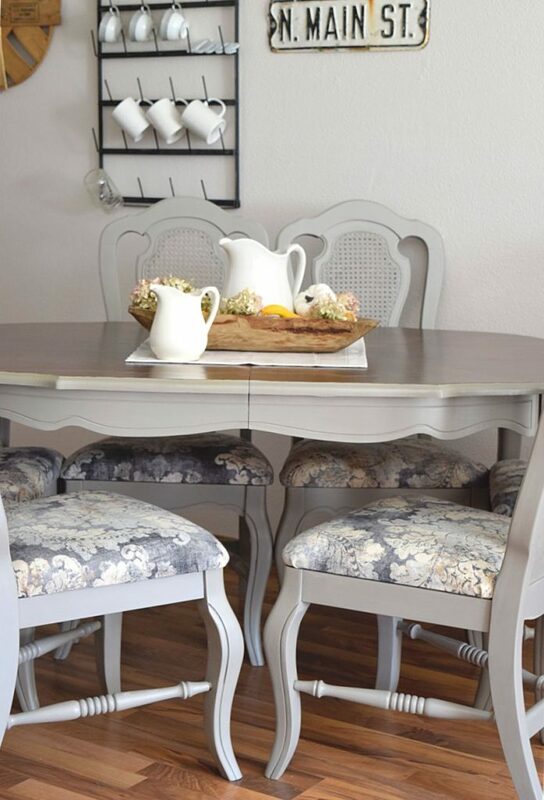 Your dining set turned out so beautifully! The grey colour and fabric you chose is really really pretty and brightens it up so much! Thank you so much Katrin, So glad you liked it! Very pretty makeover. Thanks for sharing! Thank you Cynthia! We appreciate you stopping by to visit! 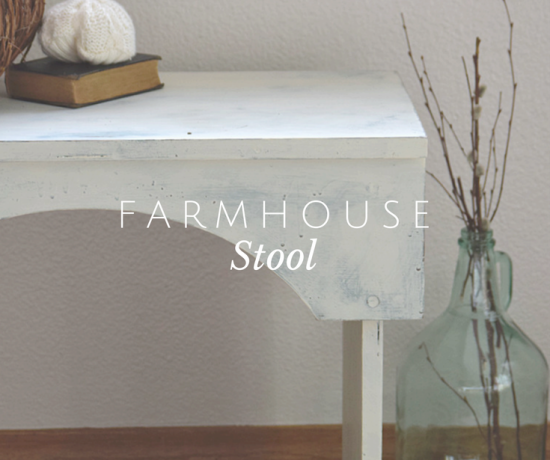 I am getting ready to paint the exact same table so was very glad to read your process. I hadn’t thought of staining the top, but now will give it a try. thanks! Oh so cool! So glad we could help to inspire you! Thanks for visiting! 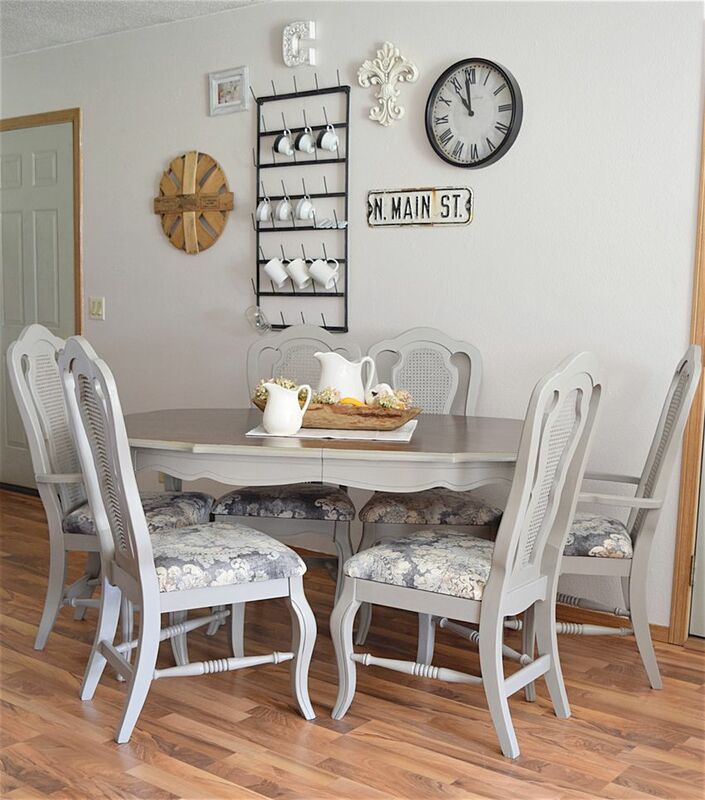 Your table and chairs are just perfect. Great find on the fabric! Thank you for joining us at Monday Social. Thank you so much Eilis! This turned out beautiful! Thank you for sharing with us at the To Grandma’s house we go link party – pinned – hope to see you Wednesday when the next party starts! Gorgeous! The fabric is perfect. Thank you for sharing with us at Snickerdoodle Create~Bake~Make link party! Thank you so much Sharon! We love that fabric too! Wow! this is beautiful! 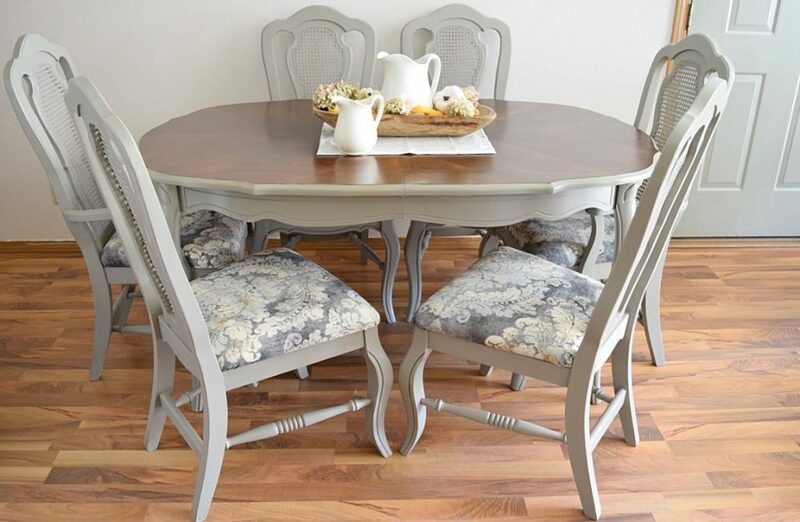 Y’all did a fabulous job on this dining room table and chairs. I just picked up a table and five chairs and I’ve been wondering what to do with it. Gray might make the maybe list. You should get a Homeright Finish Max. It’s not that expensive and as much painting as it looks like you do, it would pay for itself in no time. 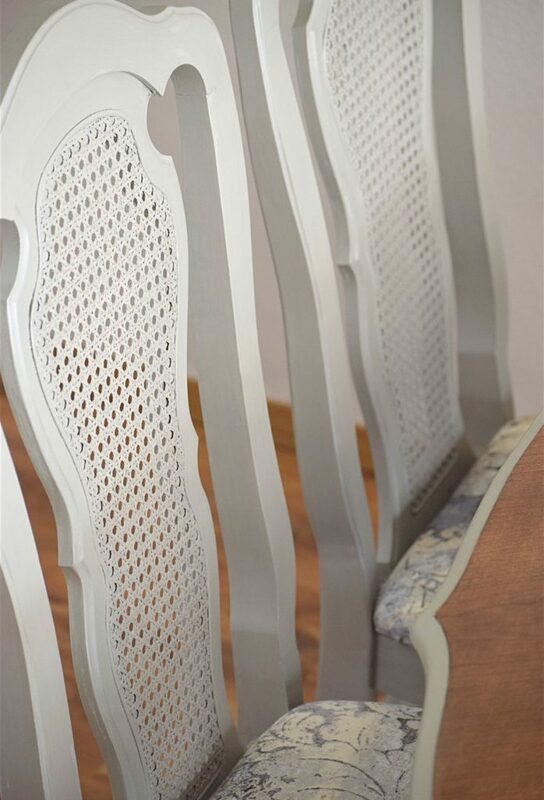 Those chairs would have been a breeze and taken about 6-7 minutes each, with a flawless finish! Thanks Gail! Yea, I don’t know why we didn’t just get a sprayer for this project-would have been so much better! Definitely getting one before we have to do anything like this again! Thanks for visiting! The table and chairs turned out beautifully. One day maybe I will get up enough courage to reupholster chairs. You make it sound so easy. Thanks for sharing at Monday Social. Thank you Judith! It is extremely easy to upholster chairs actually. We have a great tutorial for it as well! 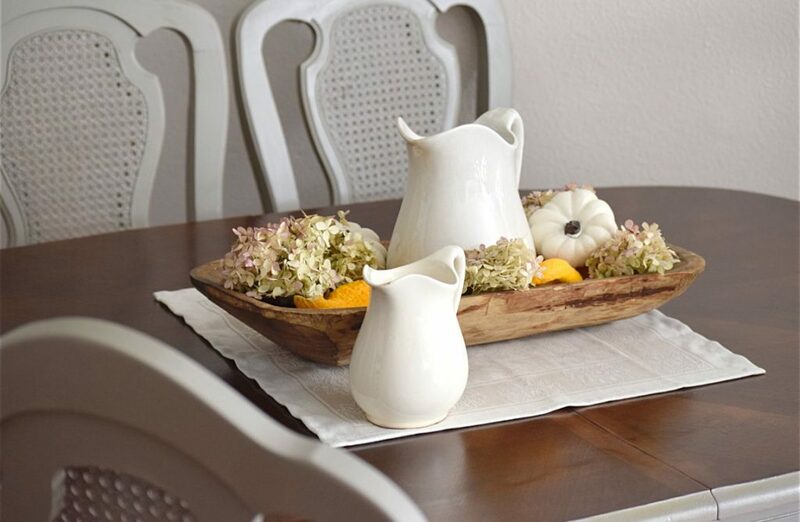 What prestain and stain did you use on the French style table? Hi Jayne! 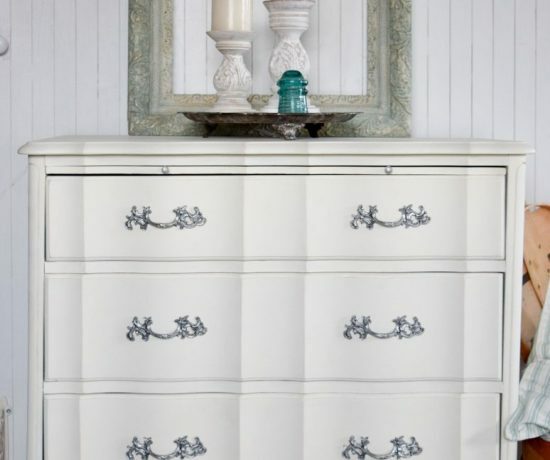 If you want to click on the link (the words “prestain” and “stain” are highlighted with a link) it will take you to the exact products we used!